By my reckoning, Glutter of Ravens is 18 years old this year. I'm not sure of its exact birthday - I don't remember when in the year it published. Back in 1998 (1996/7 more correctly, when I started to work on it) I'd not long completed my degree in archaeology, specialising in the post-Roman period in Britain, and realised that much of the historical background circulating in the world of games about my favourite period (Arthurian, Dark Ages, sub-Roman, post-Roman, Heroic Age, call it what you want) was about 20 years out of date. So I started to collate my notes from a gamer's perspective, hoping people would find them useful. This became the sourcebook part of Glutter of Ravens. Coupled with that, I'd been working off and on for many more years on a set of rules that I hoped might bring some of the flavour of the period to the tabletop. This was pre-WAB Age of Arthur, pre-Saga, pre-Dux Bellorum, pre-Comitatus, of course (actually, I think Comitatus might have been out, in a Practical Wargamer book... I'd need to check that...). So there was little in the way of 'Dark Ages' specific rules, and the period was a bit of a backwater. I wanted to add some sparkle to make it stand out as its own unique period of warfare rather than a tacked-on postscript to Ancients or low-fi version of Medievals. As an interesting aside, when Glutter of Ravens published, it was enthusiastically described by at least one shop (Brookhurst Hobbies maybe?) as a WAB sourcebook. If only! Some years later, I did get to help out James Morris and Steve Jones with their WAB Age of Arthur book, but they did a much better job than I could have and I gained some Top Chums to boot. Fate? The rules themselves were inspired by an article in Practical Wargamer by Andy Callan, in the late 1980s. He'd written about the effect of leadership, aggression and formation in Dark Ages battles. My rules were very much of their time, and I've learned a lot about rules writing since then. They're perhaps of most interest for anyone wishing to see the original ideas behind Dux Bellorum, the rules that originally started as 'Glutter of Ravens II'. Some people might still play Glutter, of course... I honestly don't know! It's not lost on me that Glutter of Ravens is now nearly as old as the books I'd originally hoped to build upon and update. Some of the info is still valid, not least because it's written for gamers so contains the kind of data not always covered elsewhere, but there's newer stuff available now. I'd heartily recommend the WAB Age of Arthur book (itself around 10 years old now! ), but few other gaming titles have delved into the history of the period in a meaningful way. 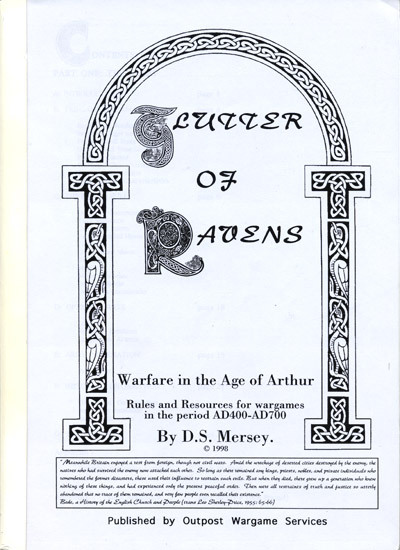 If it wasn't for Glutter of Ravens, I doubt I'd have been asked to help out with the WAB book, or that Song of Arthur and Merlin would have published in 2008 (a mere child of a rulebook at 8 years old!). And I know for a fact that Dux Bellorum wouldn't have happened in 2012... which means that none of my other Osprey titles would have been commissioned either. So really, I owe this humble little book a great deal of gratitude! 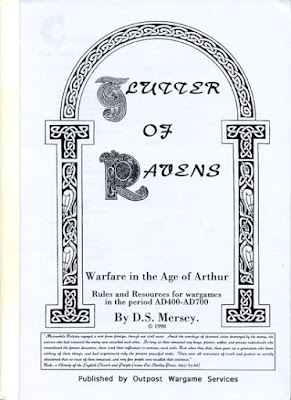 If you're interested in getting your hands on a copy, Glutter of Ravens is still available to buy from Outpost Wargame Services for the princely sum of £10.99.